One three-section Fokstrot tram was delivered to the Ukrainian capital last autumn and is expected to finish certification testing on the 1 524 mm gauge network in June. The remaining nine 26 m long vehicles are to be delivered this year. In June 2015 Pesa and Kyiv Mayor Vitali Klitschko signed a memorandum for the supply of trams. 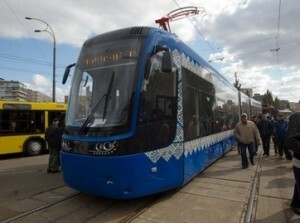 Pesa received an order for 120 Fokstrot trams from Moscow in 2013, but only 60 have been delivered, owing to the steep depreciation of the Russian rouble.